"What gets wetter as it dries?" "What runs around a city but never moves?" "What has a head, a tail, is brown, and has no legs?" 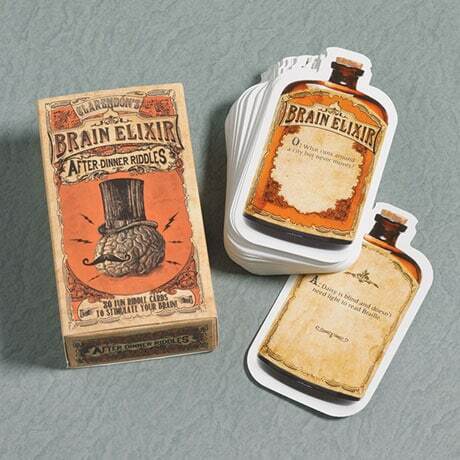 Shake up your mealtime conversations—and liven up road trips, doctors-office waits, or rainy days stuck indoors—with our Brain Elixir After-Dinner Riddles. Eighty cards (adorably shaped like old-fashioned medicine bottles!) are each printed with a riddle "to stimulate your brain" on one side and its answer on the flip side. The entire deck packs neatly away in a slide-close box, handy for tucking into a kitchen drawer or tote bag. For two or more players ages 12 and up.